First, can I tell you how hard it is for me to share this recipe?! My secret weapon at potlucks, this guac edges out my Taylor Tots as most frequently made party app. It should probably be called “Magic Margarita Guacamole” because I never liked guacamole before I started making my own. But really, what’s not to like about tequila and Grand Marnier (don’t worry, it’s just a nip-still totally kid-friendly)?! In fact, this guacamole is so magic that it has successfully converted many other non-guacamole lovers. It’s amazing on chips, tacos, salads, and burgers. Or forget all that, take a note from my toddler, and dive in with a spoon! Enjoy!! This is my secret weapon for any casual outing or game day! My husband and I disagree on the amount of lime juice to use. Try starting with the juice of just half a lime and going from there. I'm not a huge fan of cilantro, but it's a common ingredient in guacamole. 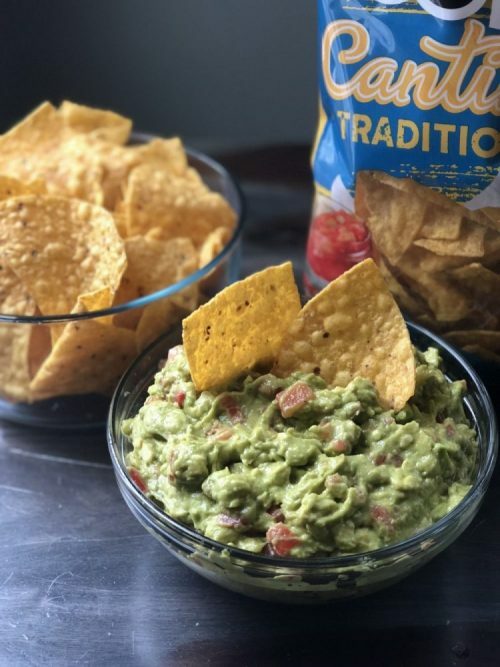 If you'd like to add this traditional element to your guac, just chop up a tablespoon or two of fresh cilantro leaves and add them in with the tomatoes and onions. I LOVE to cook, bake, and entertain for friends and family for two reasons: 1) I LOOOOOOVE food!! 2) I am a people-pleaser. I get my joy and warm, fuzzy feelings by making others feel loved and taken care of. What better way to do that than with a delicious, home-cooked meal? !